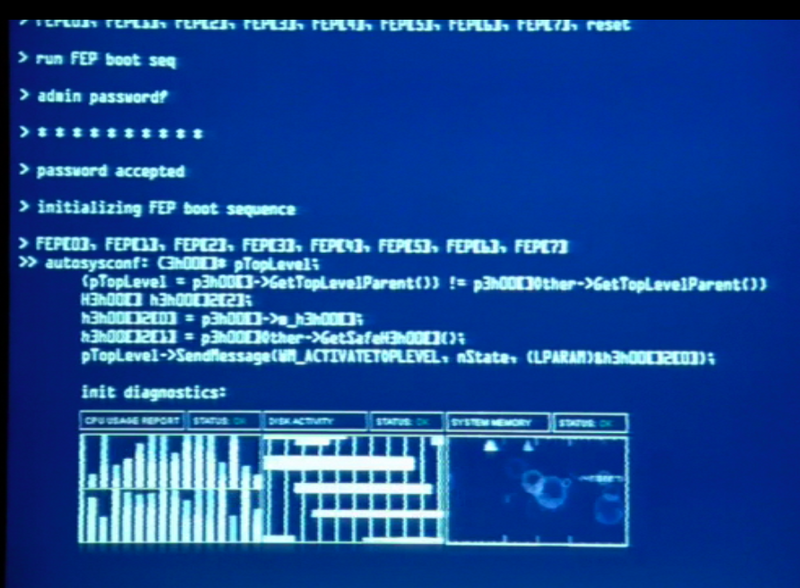 Me and Liz were re-watching season 2 of the Sarah Connor Chronicles when I spotted some familiar-looking code on John Henry's bootup screen. WM_ACTIVATETOPLEVEL sure looks like a Win32 constant, and googling led me to MSDN documentation revealing it's a private message associated with MFC. It looks like autosysconf is running some C++ code to boot up the AI. The other evidence in the series is ambiguous about what side John Henry is on, but AI code in MFC is clearly evil. Interestingly the most common use of FEP is from The Symbolics Lisp Machine as a front end processor, which would be a much more sensible language. Interestingly though John Henry (and presumably his brother Skynet) appears to be Windows/x86-based, Terminators are known to use Apple II/6502 processors. The thought of dealing with porting between those two almost makes me feel sorry for our future robot overlords.